The West Coast Bajau of Sabah, Malaysia belong to a cluster of peoples related culturally and linguistically, generally known to outsiders by the name of 'Bajau' or its variants (e.g., Badjaw, Badjao, Bajao, Bajo). The Bajau peoples most commonly refer to themselves as Sama. Their total number has been estimated at 750,000 to 900,000 (Sather, 1997: 2, 5). They are dispersed widely across the coasts and islands of the Sulu Archipelago, Borneo, and eastern Indonesia. The Bajau have traditionally been known as sea-nomads, involved in extensive maritime trading and dwelling in boats. However, the great majority of Bajau are now sedentary house dwellers (Yap, 1995:2). While some such Bajau continue to derive their livelihood primarily from the sea, others have adopted an agrarian way of life. In Sabah, there are two groups of Bajau, the West Coast Bajau and the East Coast Bajau. The dichotomy of land versus sea orientation is readily observed in these two groups. The West Coast Bajau, settled slightly inland along the western and northern coasts, have become proficient in rice cultivation and livestock rearing, whereas the East Coast Bajau, settled along Sabah's east coast and particularly in Semporna, are more sea-orientated. The distinction between the West and East Coast Bajau extends beyond the land/sea orientation. Intelligibility testing has confirmed that the West Coast Bajau and East Coast Bajau speak separate languages (Baker, 1984: 110). The origin of the Bajau peoples is uncertain. Pallesen (1985), using comparative linguistic data, has proposed a 'dispersion hypothesis' according to which the proto-Bajau spread north and south from a point near Mindanao, Philippines, over a thousand years ago. Pallesen reckons that by A.D. 1100, Bajau groups had reached Southern Sulu and the northeast coast of Borneo (116-123). Origin myths among the Bajau themselves suggest a more recent arrival to the Sulu Archipelago (Sather, 17) which would put the time of their arrival at sometime in the late 14th century. Although it is not certain when the West Coast Bajau initially settled in Kota Belud, their presence here has been documented since Spencer St. John wrote about them in the 1850s and 1860s (Yap: 2). The West Coast Bajau speak one language, (Bajau) which comprises a chain of mutually intelligible dialects (Baker: 101,111). These different dialects of Bajau also serve the purpose of identifying where the language or the speaker originated. 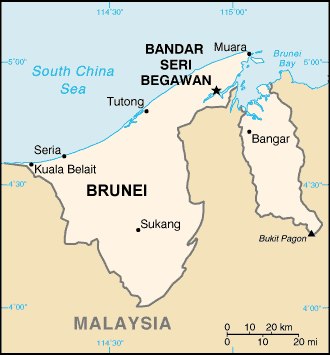 Currently the West Coast Bajau are spread along Sabah's coastal regions from Kuala Penyu in the southwest as far as Terusan, east of Pitas. They live primarily in the Kota Belud, Kawang, Papar, Tuaran, Banggi, and Putatan areas. The Kota Belud District, on the Tempasuk plain about halfway between Kota Kinabalu and Kudat, contains the largest grouping of West Coast Bajau in Sabah. Kota Belud is the cultural heartland of the West Coast Bajau; in any case it is regarded as such by the Bajau living there. The West Coast Bajau number somewhere in the range of 40,000. According to the 1991 census Kota Belud had the largest group of Bajau with a population numbering nearly 20,000. On the local scale it is most appropriate to say that the primary social organizing unit in Bajau society is the household, the backbone of which is the nuclear family, but which often expands to stem family arrangements, depending upon the stage in the development cycle of the household. Kinship is of obvious importance in shaping the structure of the household and various areas under its domain, such as inheritance and the care of elderly parents, but the Bajau household is governed more by choice of residence than prescribed family roles. Religion also plays a major role in social organization. For the Bajau, to be a Bajau is to be a Muslim and there is no such thing as a non-Muslim Bajau. Because many aspects of Bajau village life, such as the observance of Ramadan and Hari Raya Puasa, are explicitly Islamic, it is not difficult to appreciate how a newcomer to the Bajau community, once he or she has converted to Islam, becomes integrated into Bajau social life. Islam enmeshes its adherents in a common religious belief system and ritual, thus attaching shared meaning and purpose to many village activities. In many ways the Bajau are a very individualistic people, but the shared identity of Islam creates a powerful unifying bond among them. The traditional belief system of the West Coast Bajau people is animistic in nature; a variety of spiritual beings interact with human beings both positively and negatively. For example, people are discouraged from going out on foot alone at night owing to the presence of spirits of the dead, or ghoulish creatures that seek to eat babies or the flesh of recently deceased people. Traditional beliefs interact in complex ways with Islamic beliefs (the more current system). Most people subscribe to a variety of both traditional and more current beliefs, and it is difficult if not impossible to separate them. Various folk beliefs from former times still have some prevalence among the West Coast Bajau. A researcher who has spent a number of years with the West Coast Bajau says there are no missionaries that he is aware of. A good number of the more educated West Coast Bajau are literate (to varying degrees) in the national language (Bahasa Malayu). In Bahasa Malayu Scriptures have been produced in a variety of media. There is a Bajau radio station that broadcasts for a certain number of hours daily and Christian radio broadcasts could prove effective. The "Jesus Film" has has been done in Bahasa Malayu. There are several isolated accounts of West Coast Bajau people becoming Christians. However a major researcher says he has only met one. There is no West Coast Bajau fellowship that this researcher is aware of. It appears that if any do become Christians they are not welcome to openly practice their faith in their own village; some have moved to other areas. There are no West Coast Bajau fellowships that I am aware of. However, there are several fellowships (mostly SIB) composed of other ethnic groups in the area. Some of the local Christians are able to speak the Bajau language to some degree because they live near or work with West Coast Bajau people. There is no known organized outreach activity to the West Coast Bajau people. The fear of sickness, drought, or other maladies beyond one's personal control leads people to seek answers in rituals that at least outwardly take Islamic forms (e.g., recitations from the Quran), which the West Coast Bajau associate with spiritual power or protection. It is believed that the more the Islamic religion is taught and practiced, the less the forces of evil will be able to molest the people. This belief could be viewed as a spiritual stronghold on the people. To depart from Islam would mean (in their minds) to invite evil influences back into the village. Another stronghold is the reliance on doing good works (usually associated with the Islamic religion) for gaining favor with God. These good works include performance of sedekah or alms as a way of easing one's passage to the next world (or to help a deceased family member get there). They also include religious obligations, such as the practice of fasting during the month of Ramadan, and the performance of daily prayers and prayers associated with special days or events in the Islamic calendar. Another stronghold is that, in the minds of the West Coast Bajau, to be Bajau is to be Muslim. If a Bajau converts to Christianity, very likely he/she would no longer be considered ethnically a Bajau; the convert thus loses his/her ethnic identity. Not only so, but in the West Coast Bajau culture there is a significant emphasis (particularly in the villages) on communal activities, and these activities often involve rituals connected with the Islamic religion. So for a person to convert to Christianity, he or she would probably pay a very high social cost in terms of exclusion from many of the village rituals that are an important part of Bajau social life. I would identify another stronghold as fear: this time, it applies to local Christians who are reluctant to reach out to the West Coast Bajau for fear of repercussions by the government. There is actually fairly extensive contact between Bajau individuals and those of largely Christian ethnic groups, often in the context of the workplace or schools. There are opportunities for bearing witness there on an individual basis, but I do not know of any specific, focused outreach to the West Coast Bajau people. Any such outreach would have to be handled sensitively, but fear can prevent Christian fellowships from ever moving in this direction. * Pray for Gospel messages to become available in audio format for this people group.View Bajau, West Coast in all countries.